Regis offers you the support you need for the career you want. At Regis, you’ll find a professional challenge; whether you want to fast track-your career or simply want a steady job, there is a position to match your ambitions. As one of Australia’s largest aged care providers you’ll be part of a unique and supportive team where each staff member is valued. 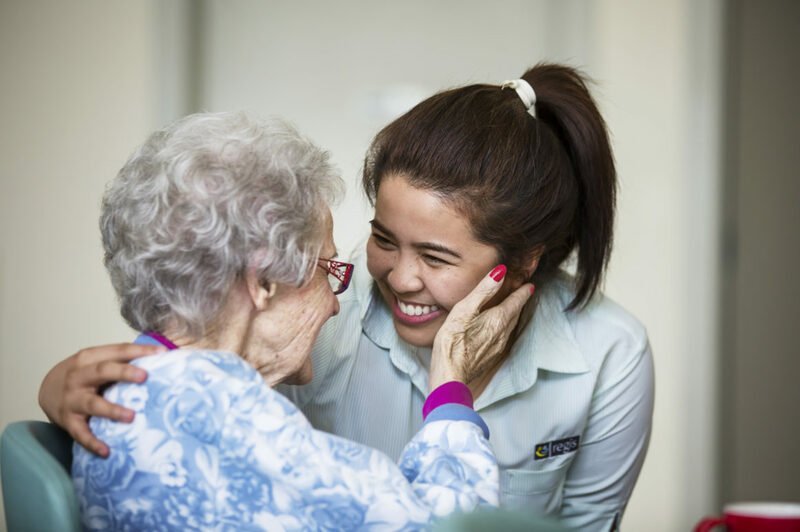 Our values lie at the core of everything we do for our aged care residents. We call this The Regis Way. Respect: We listen; we are polite and treat every person with courtesy. We are guided by our values, and we set high expectations for ourselves. All of our aged care facilities are fully accredited and undergo stringent assessments on a regular basis – both from external agencies and through our own internal audit processes. We will reward your work ethic with access to an array of opportunities to grow, learn and achieve no matter what your job role. When you join Regis, we want to bring out the best of your skills and abilities, so that you can bring your best to the people in our care. Through continual on-the-job coaching, scholarships and innovative training programs we’ll give you what you need to reach your professional goals. Every employee has the opportunity to contribute to a highly innovative aged care workplace, which celebrates new ideas and embraces change. Regis has set new benchmarks in aged and home care. We do this because we genuinely respect the people we care for and we want them to be able to live their life on their terms. Regis values the remarkable work our employees do and we have developed a program of events and opportunities for people to show their gratitude to their peers in a way which is both meaningful and inspiring. Our Calendar of Events celebrates staff achievements throughout the year including Employee of the Moment, Wall of Thanks, National Awards of Excellence, Team Events and Service Milestones. To see the latest photos from Regis staff events visit our Gallery. This award provides managers, residents, visitors and employees with a chance to acknowledge our outstanding staff and thank them for their amazing contribution. The Wall of Thanks is an innovative forum for each team to publicly thank each other for going that extra mile. The personalised appreciation can include anything from helping a colleague or making a difference to our residents’ lives. Our annual National Award of Excellence program recognises outstanding performances by Regis employees and volunteers across 12 different categories. So if you want to nominate someone and get involved visit Regis National Awards. At Regis, we celebrate successes big and small – not only as individuals but also as a team. Bringing our people together through our team events provide us with a unique opportunity to thank them for their shared efforts on behalf of both Regis and our residents. We value the loyalty and dedication of our people and each year formally recognise the achievements of around 600 long serving employees who have reached significant service milestones with us. Special celebratory events and presentations are held around the country bi-annually to thank employees for their commitment and for choosing to be part of the Regis family. It takes a special kind of person to work in aged care and in-home care and a special kind of organisation to grow and create opportunities together. This is why Regis had made a significant investment in its professional development programs to enable our employees to make a career out of doing what they love. And so our residents have a consistent, experienced presence in their lives. Our continued growth means we are uniquely placed to offer exceptional career opportunities and pathways to Regis team members – and where possible, are committed to promoting from within to ensure we retain and build on the passion, knowledge, and strengths of our people. Whether you’re looking to fast-track your career or want to improve your skills in a specific area, courses are available on-site in central locations, or through our online learning portal. Carers Connect – a unique selection process with real life scenarios and hands on support to ensure our prospective carers are indeed inducted and trained in the Regis Way. OWL Buddy Training – were talented carers are trained to mentor and guide new recruits into the workplace and support them in their role. ELearning – a comprehensive online learning system which allows you to keep up to date with the latest industry benchmarks and best practice. Face-to-Face Programs – designed by Regis to enable clinical staff to excel in each of the key areas of Documentation, Clinical Skills and Leadership, these programs guarantee practical improvement skills, knowledge and leadership behaviours. Face-to-Face Programs – designed by Regis to prepare clinicians looking for career growth. We have a specially designed program to develop the clinical and business skills of high performers. Study Days – to further support employee growth and ability, we offer a series of annual study days and provide access to workshops facilitated by internal and external subject matter experts. We also offer financial support through our annual Study Assistance Program and up to five days of paid study leave for employees undertaking approved study relevant to their work. Please click here to see the Regis Workplace Gender Equality Agency Report 2017-18. If you are a current Regis employee and are interested in taking that next career step, contact your Manager for more information about our professional development programs, or check out our promoting within opportunities just login to People Central.